Tsitsikamma is the Garden Route's very own 'playground'. Tsitsikamma is a magical pocket of the Garden Route filled with dense forest, deep gorges, glimmering lagoons and cascading waterfalls. With a name meaning ‘place of much sparkling water’ in Khoi, it’s an area of jaw-dropping natural beauty bursting with exotic plant, animal and bird life. If you add Tsitsikamma to your South Africa holiday, you’ll be instantly enchanted. 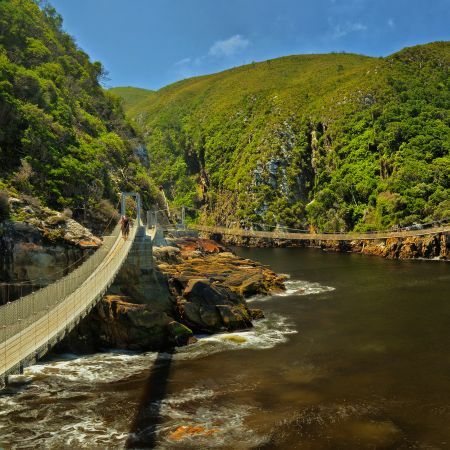 Now part of the Garden Route National Park, Tsitsikamma is a combined marine and forest reserve that holds a special place in South African hearts. It’s a narrow coastal strip stretching from the lagoon at Nature’s Valley to the mouth of the Groot River in the Eastern Cape and this unique position gives it a rare, temperate climate with a high volume of rainfall. The result is breathtaking - a fairytale jumble of evergreen forests, overgrown fynbos and ferns, dramatic gullies, rushing rivers and fresh waterfalls. The Tsitsikamma forests are home to a huge abundance of wildlife including honey badgers, bush pigs, antelope and even the occasional leopard. There are over 116 varieties of tree, including the giant Outenique Yellowwood, which can grow to a staggering height of 50m! The tallest one, aptly named ‘The Big Tree’, stands at a whopping 36.6m with a circumference of nearly nine metres. The trees are filled with twittering birds, so birders will constantly be reaching for their binoculars. It really is a living, breathing forest. There are dozens of sun-flecked, shady hiking trails twisting through Tsitsikamma, so walkers will be in wonderland here. The clearly marked trails criss-cross streams, descend into valleys etched out by rivers, open into waterfalls and lead up to coastal cliff tops where you might even spot dolphins in the breakers. Awe-inspiring scenery will unfurl before you with every step and, to top it all off, you can relax at the end of your hike on the small beach at Storms River or the unspoilt sands of Nature’s Valley. With waterfalls, lagoons and rivers flowing into the sea, Tsitsikamma is rich with marine life as well as flora and fauna. The pristine marine reserve extends 5km out to sea, protecting reef and deep-sea fish and providing unique snorkelling and scuba diving opportunities. The Southern Right Whale comes to the area to breed and there’s a good chance of sighting the Knysna Loerie and Cape Clawless Otter. 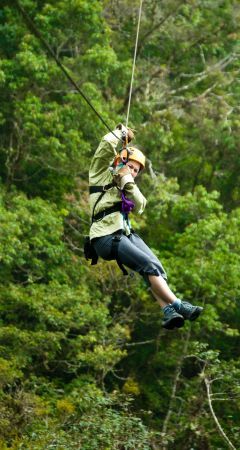 Tsitsikamma is also the adventure playground of the Garden Route, with all kinds of nerve-tingling activities up for grabs. The range of adventures stretches from mild to wild, so there’s something for the slightly jittery as well as the adrenaline junkie. There’s an endless list to choose from, including black water tubing down the Storms River, white water rafting, waterfall zip lining, tree top canopy tours, quad biking, helicopter tours, abseiling, guided hiking or the Park’s unique ‘Woodcutter’s Journey’. Travellers with nerves of steel and stomachs to match can try Tsitsikamma’s ultimate challenge - the Bloukrans Bridge bungee jump. At over 200m, it’s the highest commercial bungee jump from a bridge and features a whole 7 seconds of freefall! It’s not for the faint-hearted but it’s something that you’ll remember forever and a chance to get a unique upside-down view of the Garden Route scenery. A traditional style Cape Village of the past has been re-constructed, where old traditions of warmth and hospitality thrive side-by-side with modern comforts. The quaint B&B and self-catering chalets are very secluded and each of them has a private deck overlooking the Sandrift River Gorge and Forest Plantations. Order a 3 course dinner braai from the Fernery, or enjoy a 4 course dinner at the Lodge Restaurant, and enjoy the tranquillity of this magnificent setting at your leisure. Accommodation at Storms River Mouth Rest Camp varies - visitors can stay in forest cabins, chalets, oceannettes or cottages. There is a swimming pool for guests enjoyment, or swimming at the nearby small beach is safe.